You often have to wash, dry and even iron single flat sheets. Thanks to its department of research and development, CARACTERE is now making single flat sheets in Vylex microfibre. The fabric is opaque and white and is a combination of Nylon, polyester and viscose. Thanks so its strength and lightness, you can now fill your washing machine with up to 35% more than you can with cotton sheets. With its special fibre structure, the drying time is reduced by 50% . 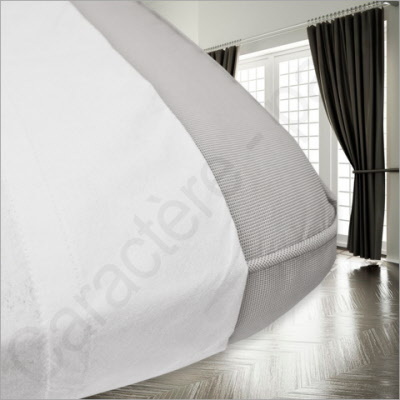 The flat sheet is very stretch resistant. The flat sheet is soft and pleasant to touch. It looks good, just like natural fibres, it is absorbent. The Vylex washable, semi-permanent flat sheet is very easy to wash and dries very quickly because it is light. Machine drying is quite possible. Ironing, if necessary, can be done at lower temperatures. How long does a Vylex sheet last ? About nine months to a year if used every day. How do you wash Vylex sheets? Simply in the washing machine with normal washing powder in temperatures varying from 30° to 70°. Can you disinfect Vylex sheets and pillow cases? It is completly possible to disinfect Vylex sheets and pillow cases during washing with non-chlorine products.